On the eve of the Montreal Grand Prix, Jean-Claude Biver, TAG Heuer CEO & LVMH Watch Division President, hosted the #DontCrackUnderPressure Challenge with Red Bull Racing Formula One driver Daniel Ricciardo, New England Patriots quarterback Tom Brady and Montreal Impact forward, Didier Drogba. The venerable athletes gathered in Montreal to celebrate TAG Heuer’s partnership with Red Bull Racing Team ahead of the competition on Sunday. The event took place at Victoria Square outside of the W Hotel, where the park was transformed with astroturf into a football field, complete with two TAG Heuer goal posts. Famed quarterback Tom Brady was the first to undertake the challenge, and set the benchmark for the number of goals scored within a minute. Daniel Ricciardo and Didier Drogba each strived to beat Brady’s record and were given only three minutes to do so. Each successful goal raised $1000 for a charity of their choice. “Though auto racing, football and soccer, each require different technical skills. Ricciardo, Brady and Drogba share the qualities of determination, strength and a commitment to excellence that endears them to fans and ensures they #Don’tCrackUnderPressure” said Jean-Claude Biver. Both Didier Drogba and Daniele Ricciardo were wearing the new TAG Heuer Red Bull Racing Formula One limited edition watch, a chronograph created to commemorate the brand’s partnership with Red Bull Racing. 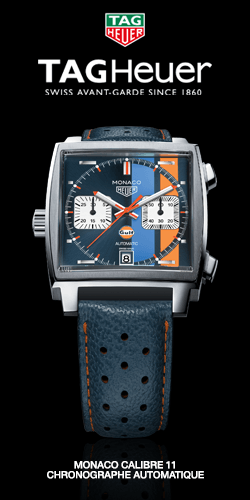 The limited edition was created in the spirit of TAG Heuer’s signature Formula One series, yielding a high performance watch inspired by automotive technology. The watch boasts a tachymeter, three white counters, (a running second counter, a minute chronograph counter and a 1/10th of a second and hour chronograph counter), indexes with luminescent markers and a caseback with special “Red Bull Racing” decoration. The watch is available with a steel bracelet or a blue textile strap with red stitching inspired by the racing belt. On Tom Brady’s wrist, the Heuer Monza Chronograph, a beautiful reissue tribute to Niki Lauda’s win in Italy forty years ago, proved that great watches never go out of fashion. Presented in Baselworld 2016 and available from July onward, its case is in titanium and it is slightly bigger than the original (42mm rather than 39) for a more modern, masculine look. TAG Heuer is the Swiss Avant-Garde watchmaker since 1860. Avant-garde is our culture and our philosophy. TAG Heuer’s unique heritage is built on pushing boundaries and breaking rules: harnessing mental fortitude to overcome technology restraints and create watches with real racing spirit and a performance touch. The brand has marked the history of watchmaking, especially in the field of chronographs with an unparalleled mechanical accuracy. With Jean-Claude Biver, CEO of TAG Heuer and President of the LVMH Group Watch Division at the helm, the new models reveal a new dynamic in terms of both the fast lead times and a completely transformed environment. TAG Heuer is currently the only watch brand to be able to communicate in the four different worlds: Art, Lifestyle, Sport and Heritage. Its partnerships (Red Bull Racing F1 Team,, German Football Bundesliga, British Premier League, US Major Soccer League, World Surf League & Big Wave Tour, FIA Formula E, Monaco Grand Prix…) and the brand ambassadors, living football legend Cristiano Ronaldo, it-girl Cara Delevingne, American Quarterback Tom Brady, Australian Chris Hemsworth, DJs David Guetta & Martin Garrix, Chinese singer GEM and actor Li Yifeng… all reflect common core values of mental strength, disruptive attitude and ambition. The brand’s motto #DontCrackUnderPressure is far more than a command – it is a mindset. TAG Heuer is part of the LVMH Group.